ABOUT 50 years ago, Gisborne began to pump raw sewage into Turanganui-a-Kiwa (Poverty Bay) via a 1.8 kilometre pipeline. Before then for decades the sewage had been discharged onto the beach at low tide, leaving the high tide to wash it away. The tangata whenua of Turanganui-a-Kiwa have objected ever since. The sore point was that the mauri, “life force” and “life-supporting capacity”, of the bay, where tangata whenua had long gathered kaimoana, was being degraded. Mixing two waterbodies, especially one so degraded such as wastewater, with the water in the bay, was a clear breach of mauri. Iwi representative and scientist Ian Ruru describes it as when “our cultural world view, values and role as kaitiaki diminished”. In the past five to 10 years, Gisborne District Council has begun to listen to tangata whenua on the matter. In 2009, work began on the Banks Street wastewater treatment plant and a resource consent variation launched the Turanganui- a-Kiwa Water Quality Enhancement Project. It had a responsibility to restore the mauri of Turanganui-a-Kiwa. The council’s Wastewater Management Committee was formed with four councillors and four iwi representatives to manage the task. Measuring a concept like mauri though, and navigating the different definitions and creating a tool to be used by the community, the council and experts alike, might be one of the most challenging jobs in freshwater management. About two years ago Ian and the council’s strategic planning manager David Wilson realised they had been talking about mauri but had no idea about how to measure it. They came up with the “Mauri Compass”. Ian says it is a “straightforward” way to discuss the mauri of a specific waterbody. It takes into account 12 different attributes, moving through tangata (people), tane (land) and tangaroa (sea) values, while including both Maori and Western science views. The attributes include tangata whenua, tikanga, wairua (spirit or soul), mahinga kai (food gathering), habitat, biodiversity, biology, chemistry, fish species, abundance, fish health and growth rates. “Pool them all together and it starts to affect the mauri,” says David. “You can look at where it is low. For example things around land — is excessive sediment run-off affecting the fish life? “We are not saying it can be fixed immediately — some waterbodies will be a 100-year journey to pull back, but it is giving a health check, then having a conversation around which areas to improve, and deciding as a community what are the ones we think we can get the best gains back from. “That is where we see the value in having those conversations. They are aware of different definitions of mauri, and how to measure it, but see the compass as a conversation starter. “We are not trying to define mauri. But it is a tool to help people articulate it, a good conversation starter with trigger questions for conversations with people around their waterways. 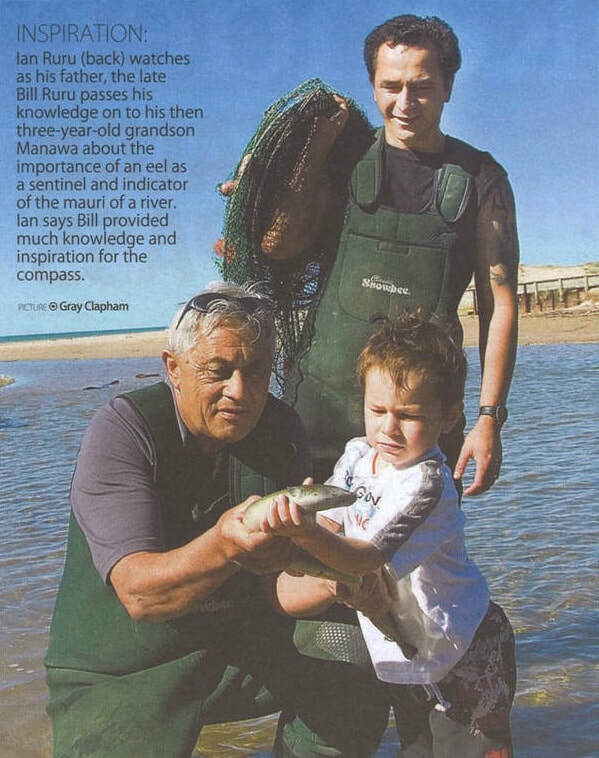 In designing the compass, Ian drew on his experiences of over 20 years teaching aquaculture and customary fishing qualifications through workshops at 300 marae with his father, Bill. They travelled as far as Rekohu (Chatham Islands) out east, Hokonui (Gore) in the south, Whanganui in the west and Whangarei in the north. “Dad would bring old school tikanga and I would bring geeky science. We were warmly hosted by every single marae. I thought we were assessing NZQA unit standards, but Dad knew it was all about the mauri of a place and its people. “We went through the process of being welcomed on to marae, shown through the whare and the history of special places and fishing spots. Then we would do our environmental assessments and check how the health of the eels relate to the health of the water. “Once I worked that out, the Mauri Compass took shape. The compass with its 12 attributes seems to resonate with a lot of people. It is a really simple way to see a complex set of inter-dependencies, and it is easy to identify and talk about areas that need improving. 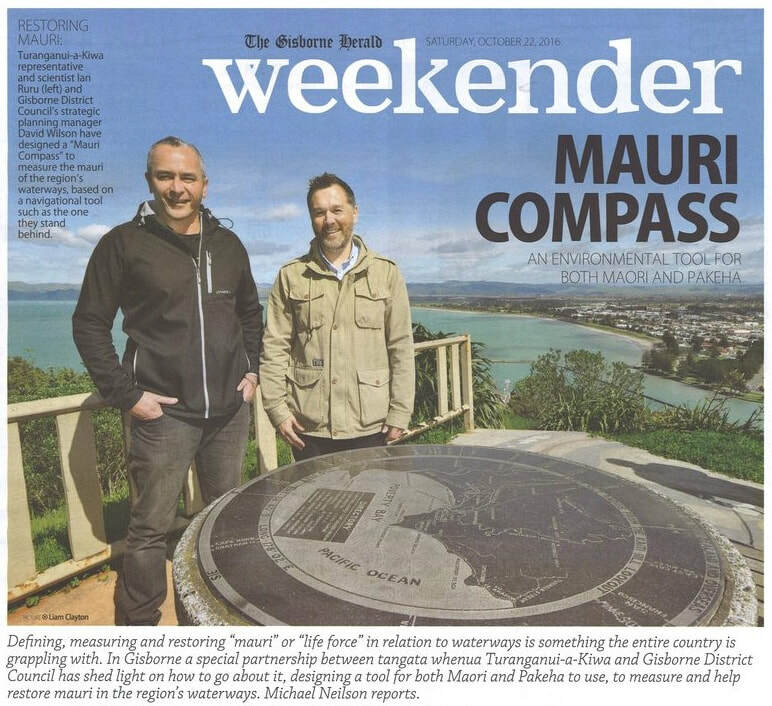 For both Ian and David, the compass is also a symbol of where the council has come in terms of its engagement with tangata whenua. “Our population is 50 percent Maori, and a lot of us on the staff are Maori,” says David. “A lot of those concerns for Maori are also of concern for our wider community. One thing with Maori though is they have been vocal the whole way through, and the message has never changed. He credits the Wastewater Management Committee process for getting them to where they are. Representatives of Turanganui-a-Kiwa, including Ian, presented the compass to the last meeting of the council’s Wastewater Management Committee in September, where it was warmly received. Ray Farmer told the committee the concept of mauri was the “missing link” between Maori and Western scientific views and would like to see it enshrined in all the Acts of Parliament. Kaumatua John Ruru said he was brought up on the Waipaoa River and had seen the local environment deteriorate in his lifetime. He remembered getting water in 44-gallon drums from the river in the summer and taking washing down to it. “We lived on eels and whitebait came right up to the Kanakanaia Bridge,” he said. Flounder were seen in the river at Kaitaratahi. In Gisborne the concept of mauri has come up recently in the hearings of both the proposed Regional Freshwater Plan, in submissions from Te Runanganui o Ngati Porou and Rongowhakaata Iwi Trust (RIT), and the managed aquifer (MAR) recharge trial. In the MAR trial, Rongowhakaata objected to the mixing of water from Waipaoa River with the aquifer water. The compass’ creators believe it can be used in such planning situations, as well as the wetlands wastewater treatment trials, to engage with affected communities and guide industry and policy-makers. David says how to measure and restore mauri is something the whole country is grappling with. “We have been to Wellington and presented the compass to the Ministry for the Environment who were really interested. Other councils have approached us too. “In Gisborne we are ahead of the curve with water and some of the stuff with wastewater, in terms of the partnerships we have.